You are here: Home » Special Features » Should DAM Be More Like Facebook? This feature article was contributed by Denzil Ford, Content Strategist at MediaValet and is part of our Improving DAM In 2017 series. I live in a big city and spend more time than I’d like to admit in a car by myself commuting to and from work. A number of weeks ago, I switched off my regular dose of musical indulgence and opted for a podcast about the world of tech startups. In the particular episode, Mark Zuckerberg was being interviewed about his role in developing an online directory for Harvard students and that platform’s subsequent transition into Facebook. The interviewer asked Zuckerberg something like: “What really made Facebook successful?” And Zuckerberg responded by reminding listeners how he had developed several other online directories and tools, but it was his dual background in psychology and computer science that inspired him to add a social component to the Harvard student directory. It was that tilt that changed everything. Zuckerberg explained that there are many areas of the brain that are geared towards people and their facial expressions and emotions. In 2004, when he analyzed the internet, he didn’t see a lot of information about people. While he created multiple other tools and platforms, the one that went on to have a strong future was the one that people ended up wanting the most because it provided them easy and direct access to other people. What does DAM have to do with Facebook and what is this article about? How can we take lessons from other online tools and platforms that have seen exceptional levels of user adoption, apply them to DAM in strategic ways, and create DAM systems that the users honestly love and genuinely care to use. Facebook taps into the brain’s pleasure center. That’s what gets people hooked on viewing, liking and commenting – engaging. Can DAM platforms be designed to engage users at that level? How? There are other tools as well. Slack, for instance, has seen tremendous success in business settings. It solves internal communication problems and eliminates the need to send an emails within the team. More importantly, slack is designed to engage employees, develop usage addiction and become a single source of truth for all projects and communications. So can these principles be applied to a DAM platform? How? But why? The problem isn’t even the same. Zuckerberg’s comments in that interview indicate that Facebook succeeded over his other developments during an early stage within the Harvard community because the social aspects got people using it and returning to use it again. The platform provided the audience value: the satisfaction of living out the natural human desire to know about other people in your community, whether you actually meet them in person or not. 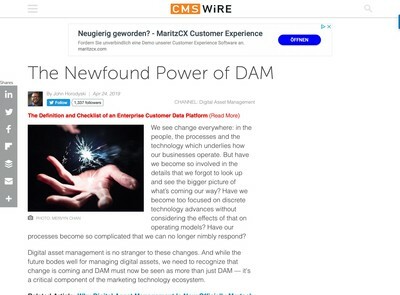 DAM is solving a different problem and at an enterprise scale. What would happen, however, if we added the social aspect of sharing, commenting and liking to the corporate library? Would DAM help build communities within a business? Arguably, the core purpose of a DAM is about organizing digital assets and creating metadata structures that allow users to search for and find specific items on their own. In fact, the idea is that individuals are empowered to be more productive and independent because DAM technology allows a small admin team to set up permissions and controls that allow dozens, sometimes hundreds, of individual users to access an entire central media library, but only view, download, edit and share a small subset of files. What benefits can be gained from sharing insights and ideas about the assets and following the success paths discovered by Facebook and Slack? Of course, completely changing DAM to more closely model Facebook might be taking it too far. What undoubtedly holds potential for moving forward is the idea of making end users fall in love with the interface and smoothly connecting to the tools already actively used in the workplace. What are the elements that make DAM more sticky? Stickiness can refer to many things depending on the technological context. In consumer contexts, something that is “sticky” encourages buyers to stay on a website or app longer and continue returning. For instance, a contest on social media that offers a free prize for participation is a “sticky” tactic. In enterprise scenarios, stickiness comes from the implementation of techniques that encourage employee usage and drive certain behaviors. If we apply the psychology of how humans interact with apps in general, what features would provide DAM users more value than they are currently getting from the technology? A simple example here would be adding a news feed to DAM platforms that provides suggestions or features the assets uploaded last. What if the favorite photographer was voted up or the most successful content got shared with the entire team or company? But would such features actually provide value when the vast majority of DAM users aren’t concerned with news about the status of digital assets in their company’s digital media library? When an individual’s interaction with the DAM centers on using a limited number of items, most of the collection is perceived as noise. What’s critical in this scenario is the ability to deeply personalize those feeds. They are only meaningful if they are relevant to the user or to the specific group. When we are talking about rolling DAM technology out across organizations, the power of adding this kind of “social” function has to be paired with the level of intelligence and relevance in order to create the stickiness and engagement for DAM as a platform. Platform we love vs. invisible DAM? This isn’t really about Facebook. These thoughts came to me while listening to a podcast about the birth of Facebook, but the discussion I am trying to open isn’t about blindly applying the design from social media platform on top of a DAM. It’s about developing a platform that people love and are passionate about using over and over again. The ideas here call to a deeper discussion about whether or not DAM should be a front-end tool that most users, admin and general users alike, physically have to login to in order to access digital assets. If yes, what is the design that will best serve customers? Or should DAM technology disappear into the background and become a back-end tool that works silently behind more familiar, everyday apps? Ralph has discussed this previously here on DAM News. For instance, in How different will DAM be in 2030?, he says he can see DAM functionality separating out into two different kinds of tools: 1) management tools for analytics, controlling access, monitoring, batch operations and ad-hoc cataloguing and 2) search/selection interfaces for people who need to quick access to assets for organizing and manipulating. Imagining a DAM solution modelled after Facebook is to think about designing one of these search/selection interfaces for businesses who need quick access to assets for organizing and manipulating, but in a very specific way centered on providing more value to the people actually using the DAM. How do we make the employees of companies LOVE using their DAM? Really. What would that look like if they adored using it? This isn’t just about adding a social component to DAM. It’s about tapping into the aspects of social apps, like Facebook, and business tools, like Slack, that legitimately give users a platform they can’t help but use because it solves business needs while feeding human desires to engage. The idea is that visual representations of our world and a company’s intrinsic knowledge (digital assets) would be woven into the ways that teams communicate with one another, how the company visualizes itself internally, and how teams develop cohesive relationships with extended partners. All of these internal interactions would be the foundation of this DAM interface’s connection to outward-facing platforms that use visual elements to build relationships with external audiences, potential and returning customers, and all of an organization’s stakeholders. 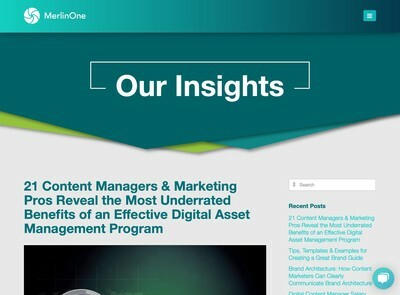 So imagine you have full access to use and share an enterprise collection of digital assets, but the UI you engage with gives you the power of a central hub combined with a news feed that lists insights about assets. When a marketing manager starts planning a new collateral item, a proposed visual comes up based on the data within your organization or even web data at large. This function is available within any of the productivity tools the team is using day-to-day so your teams can work on proposals in Word, make PPT presentations and send emails or instant messages – all with immediate access to a central media library of digital assets. Users can see their own most often used assets and get data about them. Teams can create group pages that offer details about the progress of ongoing projects or report recent successes, notifications of completed projects, and preliminary results. Trending news summarizes the most used assets in your company this week. As AI and other technologies continue to develop, this interface would become a hub for insights and a tool for spreading information gathered from those items. This interface acts as a central hub of connectivity that keeps content and visuals at the forefront of interpersonal connections and daily work life. This interface helps build community among employees while encouraging the use of appropriate images both within the social functions of this interface and outside in other applications (design, document, or social media management tools) that will be used to create more outward-facing materials. 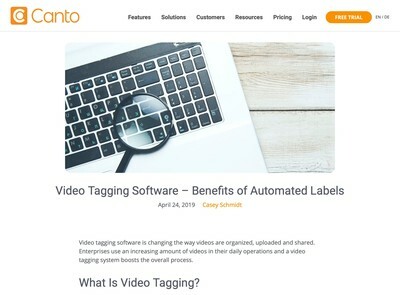 This new DAM interface doesn’t negate the need to work in other applications, and in these other business applications, there is still an integration that allows users to search the DAM for images as they develop documents or other projects. Will more time be wasted in this social interface than value provided? Will employees actually be enticed to use such an interface, which is also to ask, will the anticipation of interacting with work colleagues be appealing enough to get people using such a platform? Is asset usage reporting enough and all additional social functions tacked onto DAM technology would become merely a distraction from real work that needs to be done? How will existing technical architectures support this sort of innovation? What aspects of other tools do people love that also solve business problems relevant to digital asset management? Humans need and desire interactions with fellow humans. 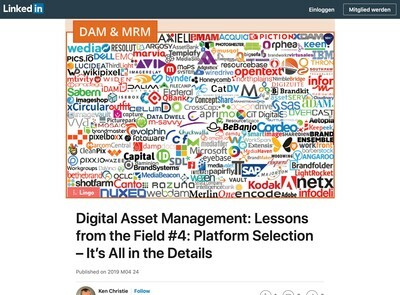 Arguably, Instagram and Facebook are successful because of the combination of these two items, but the social media platforms can’t do what DAM does at an enterprise level as far as actually managing digital assets. It seems to me that DAM technology is in a particularly primed position to truly leverage what we know about human motivations in relation to the use of technology. Even though I’m talking about the front end component that DAM users experience, DAM as a “platform underpinning other applications across the enterprise” is exactly what is on my mind here. DAM is a tool with visuals literally at its core that has been built to serve organizations with human beings at their core. What design motivates users to use and LOVE their DAM? What functions in what forms will be beneficial to which specific components of business for different DAM users? What forms of DAM will maximize the value offered to humans whose brains respond strongly to visual stimulation and their own desires to connection with other humans? People have written over and over again that when we get positive feedback on Facebook, positive reward emotions light up our brain. Would it be valuable to incorporate this effect into DAM solutions that also solve particular kinds of business problems? It’s gone a bit quiet now – I’m not sure if that’s because many applications now include gamification techniques and it’s no longer news or if it didn’t work quite as well in business solutions as in consumer apps/websites. We considered adding gamification features to our solution (reputation scores based on number of metadata edits, likes of uploads, etc; league tables – that kind of thing) but didn’t, mainly because we found no evidence that our clients/users wanted them, and so they never reached the top of our backlog. However, it’s still an interesting area and one I would like to find out more about, especially in terms of evidence for (or against) its effectiveness at motivating (business) users in the right way, i.e. getting them to spend their time doing things that bring value. I suspect this is the problem – for an organisation that wants to encourage its employees to prioritise their activities by the true value they deliver – i.e. apply lean thinking – gamification could be a blunt instrument. I’d love to hear what other vendors or end users think about this, especially those who have seen it in action. Thanks for commenting, Martin. That is really interesting that at the time, you found “no evidence that clients/users” wanted” gamification features. I’d also love to hear more about what other vendors AND end users think about this. I myself don’t develop software, but I’d love to see a demo developed and then a way for users who already use DAM to get their hands dirty. Do people who use DAM to run their businesses find value in such features? And which ones because my guess is that not all features that could be added are actually going to provide enough value to actually make them worth building out at scale. Perhaps “we found no evidence that our clients/users wanted [gamification features]” was a bit strong. As with most product development teams we have an almost endless (prioritised) backlog/wishlist, and stories relating to gamification have never reached the top. Certainly we didn’t/don’t get many clients/users asking for them, but perhaps this is one of those (innovative?) areas that users would need to experience before seeing the value. Point taken. And I agree, it does seem like an area/functionality that needs more show rather than tell. Great article. Your thinking really aligns to my views on where DAM will go and the role that it can play in underpinning an organisation and breaking down silos. The consumer software space has demonstrated how mass adoption works and products like Slack are further demonstration that the same human psychology creates a similar adoption curve within enterprise environments. I’d be really interested in listening to the Zuckerberg interview that you referenced. Would you mind sharing the link?